Have you ever been to Italy? Have you ever heard of a place called Cinque Terre? If you haven’t, do a Google image search and you will probably want to go there. I visited Cinque Terre about 4 years ago while I was studying abroad and I wish I could have spent more time there. It was absolutely beautiful. It’s known for its breathtaking views, colorful buildings, and hiking trails. On the food side of things, Cinque Terre is known for their pesto and focaccia bread. When I was there, I had both. 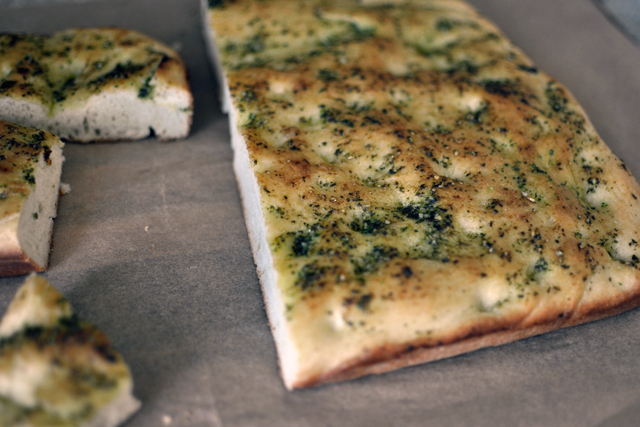 I remember getting a big FAT square of focaccia covered in pesto from a little hole in the wall bakery in one of the towns there… best thing I’ve ever eaten. This isn’t exactly the same, but it’s close enough for me until I can go back some day. If bread baking isn’t your thing, I also use the pesto recipe below when I’m making pasta with pesto. This recipe makes more pesto than you will need for the focaccia. I suggest freezing the leftovers and using it on pasta or a caprese salad. Also, if you want to make a smaller loaf of focaccia, you can freeze half of the dough after the first rise to save for another time. 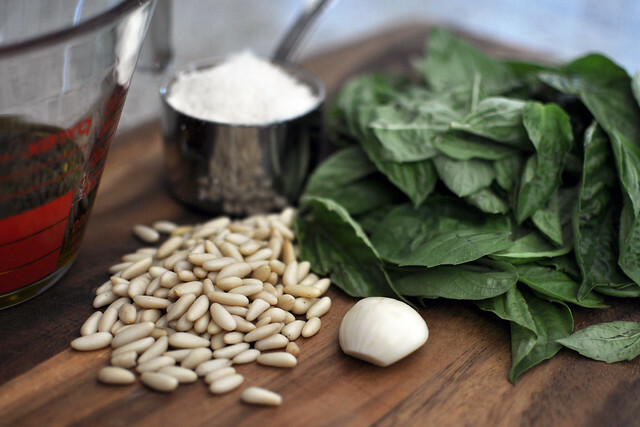 Make the pesto: Combine the basil, garlic, and pine nuts in the food processor and pulse until coarsely chopped. With the food processer running, add the olive oil through the feed tube. Transfer the mixture into a small mixing bowl and add the cheese and season with salt and pepper to taste. Mix until combined. Make the focaccia bread: In the bowl of your standing mixer, combine the yeast, water and sugar. Stir to dissolve, and let sit for 3 minutes, until foamy. With the mixer fitted with a dough hook, turn the mixer on low speed and slowly add 3 1/2 cups of flour to the yeast mixture. Add the dissolved salt (doesn’t have to be completely dissolved) and slowly pour in the olive oil. When the dough starts to come together, increase the speed to medium and mix for about 8-10 minutes, until dough is smooth and elastic. Add the remaining flour a tablespoon at a time if the dough is too sticky. Turn the dough out onto a clean counter and knead a few times before forming the dough into a round ball. Place the dough ball into a large oiled bowl, turning it so that it is coated with olive oil. Leave the dough ball in the bowl and cover with plastic wrap. Let rise in a warm place for about 45 minutes, until the dough has doubled in size. Preheat oven to 400 degrees and coat a sheet pan with olive oil. Turn out the dough on your work surface. Roll and stretch the dough roughly into a rectangular shape (doesn’t have t be perfect); the dough should be about a 1/2 inch thick. Transfer the dough to the oiled sheet pan, cover with plastic wrap, and let sit for 15 minutes. Uncover the dough and use your fingertips to make dimples in the dough. Brush the dough with extra-virgin olive oil and then brush the dough lightly with the fresh pesto. Bake the bread in the lower third of the oven for 15 to 20 minutes, until the top is golden. Once removed from the oven, brush the bread with more of the fresh pesto.